As part of our upcoming video series on The Best Lightweight Down Jackets we used a FLIR Thermal Imaging Camera to capture a thermal signature for each jacket reviewed. In this video we give you a quick overview of our observations. In this article the staff at ProLite Gear discusses Lightweight Down Jackets and give Premium Performance and Best Value Awards. ProLite Gear reviews the Mountain Equipment Lhotse Jacket, which uses the new GORE-TEX Pro membrain. This latest generation membrain from GORE is much more air permeable than previous generations of GORE-TEX membrains like Pro Shell, Active Shell, PacLite, XCR, etc. What is the future of Outdoor Products? A brief video speculating on the what products will look like in the future, how they will be made, and purchased. ProLite Gear tests the air permeability of new GORE-TEX Pro vs. the previous generation. GORE-TEX Pro Shell. While they are similar in name, the new GORE-TEX Pro is much more air-permeable than the old stuff. ProLite Gear reviews the Exped DownMat Lite 5, a 21 ounce sleeping pad with an R-Value of 4.1. 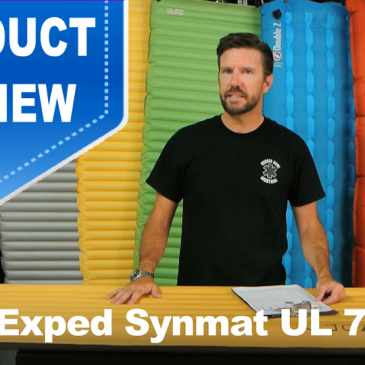 ProLite Gear reviews the Exped SynMat UL 7, a 16 ounce sleeping pad with an R-Value of 3.1.